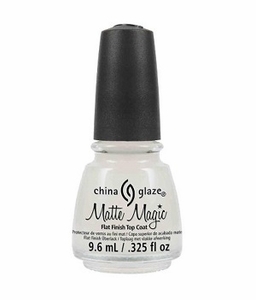 China Glaze Matte Magic in .325 oz. is a flat finish top coat. It turns shiny, glossy nail polish finish to a flat, matte finish. It can be used over shimmery and glitter nail polishes also. Use Matte Magic just like any other top coat, apply on nails after using nail polish. Note: .325 oz. bottle is smaller than a standard .50 oz. bottle.